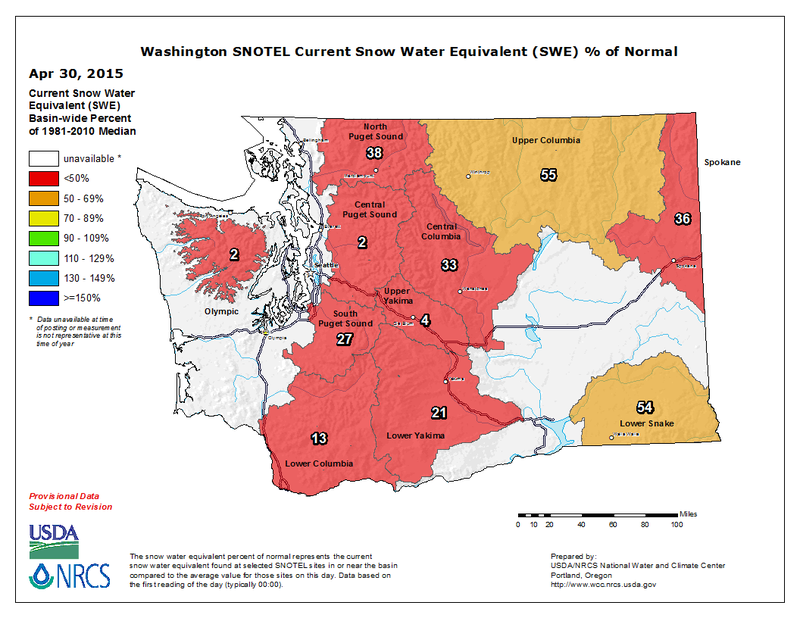 We all know that mountain snowpack equals summer gold for the Washington economy. Unfortunately, the reserve is nearly empty this year. The purpose of this posting is to provide historical context and perspective on the 2015 drought situation and to examine our current status, how we arrived at this point, and what we can expect going forward. Given the exceptionally warm weather during especially December, February, and March, along with the record/near-record low mountain snowpack (Figure 1), AgWeatherNet has been concerned about 2015 water supplies and potential drought issues for some time now. Although the weather during the first half of April was a bit better than February and March due to slightly cooler and snowier conditions in the mountains, there was very little improvement in the overall snow drought situation. Unfortunately, we may not only be facing a low water supply issue, but also a higher demand issue (relative to normal), since higher evapotranspiration rates are likely this summer. The long range outlooks continue to suggest enhanced odds of warmer and perhaps drier than normal conditions for Washington through early 2016. During the summer, the main impact of such conditions could be an increased demand for water resources. As we progress into next winter, the main concern would be another poor snowfall/snowpack year for the mountains. In fact, the CPC (Climate Prediction Center) suggests that the odds of warmth are greater than 60% (50%) for western (eastern) Washington through early autumn, and greater than 40% into early spring 2016. In terms of precipitation, odds of anomalous dryness are greater than 40% (33.33%) for the western (eastern) half of Washington for the summer through autumn time period, and greater than 40% (33.33%) for the eastern (central) part of Washington for the late autumn to late winter or early spring 2016 period. As is normally the case, confidence regarding precipitation is lower than for temperature. It is important to note that the aforementioned probabilities are based upon a three-tiered classification system of above, normal, and below. Thus, a 50% probability of above normal temperatures suggests that there is a 50% chance of temperatures falling within the warmest third of years (well above normal temperatures), a 33.33% chance of temperatures in a normal (one-third of years) range, and a 16.67% chance of temperatures being in the coolest third of years. In other words, given a two class system of above and below, (with only a slim chance of values being right around normal), that (3 class) 50% chance becomes roughly a 66.67% (2 in 3) chance of above normal (falling in the warmest half of years), and a 33.33% chance of below normal (falling in the coolest half of years). One of the major considerations when assessing Washington climate is ENSO (El Niño Southern Oscillation), which describes the periodic variability in the coupled atmosphere-ocean circulation of the tropical Pacific Ocean region. 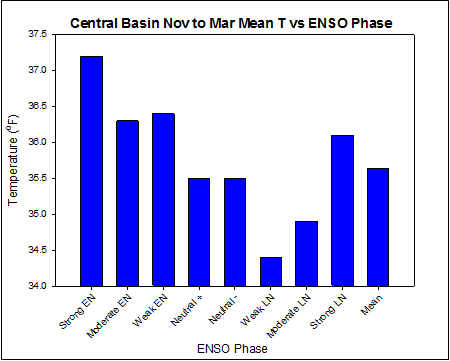 The phase of ENSO can significantly impact the seasonal climate of mid-latitude areas such as Washington. El Niño is the warm or positive ENSO phase, and seems to be strengthening at present, as indicated by the warm (orange) equatorial Pacific Ocean temperatures in Figure 2. 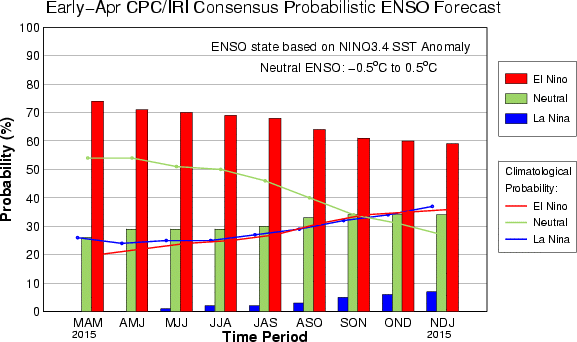 Relative to earlier in the spring, it is now more likely that a stronger El Niño event will be in place next autumn and winter (Figure 3), which would again favor a warm / poor snowpack year (Figure 4). Numerous factors influence seasonal climate in Washington, but ENSO is one of the more significant modes of climate variability. An additional factor to consider is the Pacific Decadal Oscillation (PDO), which describes the variability of the pattern of sea surface temperature anomalies across the mid latitude Pacific Ocean. Although the underlying processes that govern the PDO, along with the associated dynamical interactions with the atmosphere are less well understood than ENSO, there does appear to be a notable link between Washington seasonal climate and the PDO. 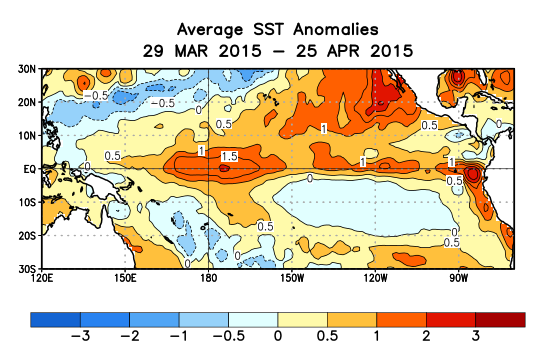 Figure 5 shows the departures from normal for sea surface temperatures as of March 16, 2015, which matches well with a positive (warm phase) PDO. Stated simply, the positive PDO phase is characterized by unusually warm water (orange color) in the eastern Pacific Ocean off of the west coast of North America, and cool water in the subtropical Pacific Ocean (blue color). Following near record values during this past winter, the PDO phase continues to be strongly positive. Although it is not certain that the PDO will persist at its present strength due to inherent forecasting difficulties, a positive PDO would further enhance the odds of continued warm and dry conditions. It is postulated that the large area of cool (warm) water increases the chances of a trough (ridge) in the central Pacific Ocean north of Hawaii (near the west coast). Such an atmospheric setup increases the odds of southwesterly air flow transporting relatively warm air masses into Washington. When the phases of PDO and ENSO are both positive, as they are at present and will likely be in the near future, warm and dry conditions become more likely. In fact, since a late developing El Niño played a questionable role (at best) in this past winters warmth, it is hypothesized that the very strongly positive PDO was a contributing factor to the persistence of the warm ridge of high pressure that dominated Washingtons 2014/2015 winter. It is worth noting that the PDO-temperature connection is not so much the direct effect of air blowing off of warmer than normal water, but rather the indirect effect of the change in the atmospheric circulation leading to anomalous, seasonal mean southerly air flow. In other words, this winters abnormal warmth is owed in large part to the observed atmospheric pattern, regardless of its cause. Other available dynamical and statistical models for long range weather/short range climate forecasting point toward warm, and to a lesser extent, dry conditions in the next 12 months. The near unanimity and lack of dissent among the major climatic indicators explains the aforementioned high probabilities of warm and dry conditions. 500 mb heights are the single best atmospheric variable for assessing and evaluating weather and climate. Troughs are areas of low heights and cool atmospheric temperatures, while ridges are regions of high heights and warm atmospheric temperatures. The upper level winds tend to blow from a region south of the troughs to north of the ridges. 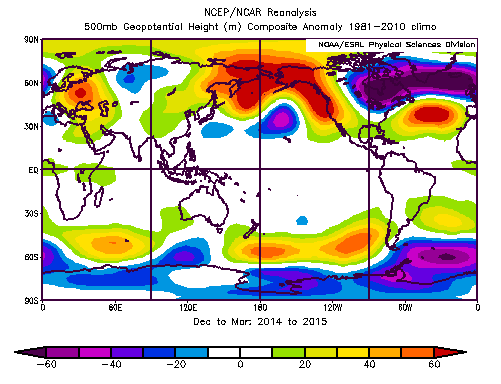 The 500 mb height anomalies (Figure 6) for this winter (December 2014 to March 2015) show a mean trough (purple) north of Hawaii, and a mean ridge (red) near Washington. The air flow from the trough to the ridge featured a stronger than normal southerly component, which meant that the source region of our winter air was unusually far to the south, and thus warmer than normal. Overall, the 2014/2015 December to March time frame was the warmest such period on record for Washington State in 120 years of data. Interestingly, the atmospheric circulation pattern from this winter was remarkably similar to the underlying pattern of ocean temperatures. 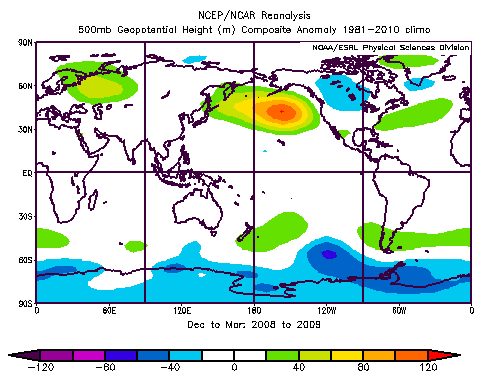 By contrast, the 500mb height anomalies taken from a recent negative ENSO/PDO winter (December 2008 to March 2009) shows an anomalous ridge in the north Pacific (Figure 7). Air flow over this ridge tended to exhibit a northerly slant on average, and temperatures were below normal. The only other winters since (PDO index) records began (in 1900) to exhibit as consistently high PDO values as 2014/2015 occurred in 1939/1940 and 1940/1941. Those winters were also much warmer than normal, although still cooler than this winter. 1939/1940 is listed on the Mt. Rainier National Park website as Paradises least snowy winter on record. In fact, anecdotal evidence from the 1939/1940 winter lies in the story of skier Sigurd Hall. Mr. Hall was tragically killed at Mt. Rainier during the April 1940 Silver Skis race after striking fog-shrouded rocks which presumably were unusually exposed due to the low snowpack. As is always the case, we encourage folks to check in with AgWeatherNet for weather/climate and decision aid information. AgWeatherNets irrigation scheduler allows for the efficient utilization of water resources, such that enough water is supplied to maintain the health of the crop without wasting water. Also, our Growing Degree Day (GDD) calculator shows how accumulated heat units are progressing this year relative to previous years. The bottom line is that a drought has arrived, and it shows no sign of departing anytime soon. There is no need to panic, but the time to plan and prepare for limited water resources is now.